By Musket - Mersey by Knowsley. "Five to one bar one," the bookmakers' cry when taking odds on Carbine's races, was the tribute chanted to "Old Jack" by over 7,000 adoring Australian fans when he arrived at the dock for shipment to England, after an amazing racing career and some years at stud in Australia. So successful in his career, unplaced in only one race in 43 starts, he was barred from bets at any odds by bookmakers. Already having sired some exceptional racehorses and sires in Australia, he made the long overseas voyage--which included a bout of colic and surgery--to stud book history at the Duke of Portland's Welbeck Stud, where he sired the Derby-winning Spearmint, whose daughters -- including Plucky Liege, Catnip, Bathing Girl, Fausta -- have had a lasting effect on the breed. His sire, Musket, stayed in England long enough to get Petronel, winner of the 2000 Guineas and the Doncaster Cup, and Goodwood Stakes winner Brown Bess before his export to New Zealand by the Waikato Agricultural Company, intended as a sire of coach horses. He had been poorly patronized as a stallion in England; his sire, Toxophilite, had been a bleeder, and his dam's family had a reputation for producing horses affected in the wind. Showing little early promise, his owner, the Earl of Glasgow intended to have him shot at the age of two, despite his trainer's pleas; fate intervened when Lord Glasgow died himself, and Musket, along with the Earl's other horses passed to Lord Peel and George Payne, and there was no more talk of shooting the colt, who went on to win nine races, including the 2 -1/2 mile Ascot Stakes. 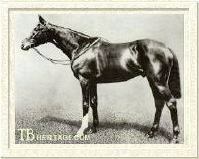 In New Zealand, Musket was an instant success as a sire of race horses, rather than coach horses, becoming that country's greatest sire of the mid 19th century, getting 26 winners of 87 classic races there, including another great hero of the turf and breeding shed, Trenton; leading sire Nordenfeldt; Martini-Henry, winner of the VRC Derby, St. Leger and Melbourne Cup and later sire of five class winners, and Maxim, a good sire in New Zealand, Australia, and later California. Carbine's dam, Mersey, was by the Stockwell son, Knowsley, and out of Clemence, a half-sister to the great race mare Imperieuse (winner in England of the 1,000 Guineas and St. Leger). She was unraced, and was sold out of the Hampton Court Stud to New Zealand. 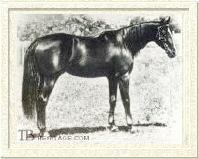 Her third foal in New Zealand was Carbine, bred by the New Zealand Stud Company, and foaled at Sylvia Park Stud, Auckland in Spetember of 1885; he was the last great foal of Musket, who died two months after his birth, age 18. Purchased for 620 guineas at the 1887 Sylvia Park sale by owner-trainer Dan O'Brien, the light-framed colt made his debut in the Hopeful Stakes at Riccarton, New Zealand at age 2, winning effortlessly. At age 3 he triumphed in the Derby, the New Zealand Cup and the Canterbury Cup, and then was shipped to Australia to run in the V.R.C. Derby, which he lost by a head, a "fluke" blamed on his jockey. He won two more stakes in Australia, and then was sold to Donald Wallace for 3,000 guineas. Under Wallace's ownership, and the expertise of trainer Walter Hickenbotham, Carbine went on to win, among others, the three-mile Champion Stakes, followed the next day by the mile All Aged Stakes and the two mile Loch Plate. His other notable wins his 3 year old year included the Sydney Cup, won in record time with twelve pounds over weight for age, and his spectacular win of the two mile Cumberland Stakes, in which he almost fell, and recovered to to overtake the leader at the post. He fought a split heel at the beginning his four year old year, and throughout the rest of his career, battling gamely to places and his one unplaced start in the first part of the season. After rest, he returned to win 9 races that year, including the Autumn Stakes, the Sydney Cup, and the Australian Jockey Club A.J.C. Plate. At age 5, he won Melbourne Cup at top weight in a two-and-one-half length victory that was one of the biggest crowd-pleasing efforts of all time. That 1890-91 season he won ten of his eleven starts, his last the 3 mile A.J.C. Plate again. His final record was 33 wins, six seconds, three thirds, from 43 starts; he was unplaced only once. Spearmint (1903, Maid of the Mint), Derby winner and top broodmare sire in England He was retired in October of 1891, with lifetime earnings of £29,626, that remained a record in Australasia for thirty years. Installed at Wallace's Lerderberg stud in Victoria, with an unheard of 200 guineas stud fee, his first foal was WALLACE, a top racehorse and leading sire, who in turn produced winners of over 950 races. He also got LA CARABINE, AMBERITE, and FUCILE. His son GREATOREX, a minor winner in England, was sold to South Africa, where he became leading sire ten times and had a significant impact on bloodlines there. Affected by the world-wide depression of the 1890s, Wallace sold Carbine to William Bentinck, (6th) Duke of Portland for £13,000, the Duke having decided "...it advisable to own a stallion that was in no way related to my own horses (St. Simon, Aryshire, Donovan, St. Serf, or Raeburn)." Following his voyage to England, and installation at Welbeck, a stud with at that time over 200 years of historic thoroughbred production, Carbine entered the lists with a full book for three years at a fee of 200 guineas. He was not an immediate success, and his stud fee fell thereafter. Portland later said, "He was not a great success so far as my own stud was concerned, but, I think, he justified himself in this country, for his son, Spearmint, won the Derby and the Grand Prix de Paris, and was no doubt a very good horse indeed, while his grandson, Spion Kop, and his great-grandson, Felstead, were both Derby winners." His granddaughters, through SPEARMINT, are honored names in pedigrees. Bathing Girl (1915), was dam of Annette K. (dam of Brushup, Fleet Admiral and War Glory) and Seaplane (1922), dam of Dinner Time. Catnip (1910), produced Nera di Bicci, dam of Nuvolona, Neroccia and Nealla da Gubbio, and Nogara (1928), the dam of the great Nearco, the unbeaten Niccolo dell'Arca, and Italian Oaks winner Nervesa. Fausta (1911) produced Italian classic winner and top sire Michelangelo and Michelozza, among others. 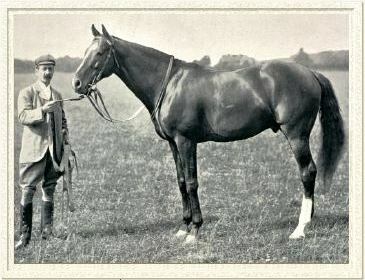 Hemlock (1913) was second dam of the racehorses Display (1923) and Teheran (1924). Plucky Liege (1912) produced the amazing collection of youngsters Bull Dog (1927, Teddy), Sir Gallahad III (1920, Teddy), Quatre Bras (1928, Teddy), Bois Roussel (1935, Vatout), and Admiral Drake (1931, Craig an Eran), among others. Carbine eventually reached a height of 16.1 hands, and was described as lightly made, with long cannon bones and a plain, long head. He had a deep barrel and excellent shoulder. His light bay color was often called "mealy." He had a number of personality quirks which generally endeared him to his adoring public, including planting himself in the post parade, and staring off into the distance for a time while his fans cheered him and his handlers tried to get him to move on. In the instances when he did not place first, and thus not the first to the scales, he would throw a tantrum. He disliked getting his head wet, to an extent that a "hat" was devised for him to keep the top of his head and his ears dry during inclement weather, and that hat traveled with him to England, where he also wore it. When at stud in England, he received regular ridden exercise, the first few minutes consisting of bucking, after which his long-time groom, Jack Cunningham, who came with him from Australia, would slap him on the neck, "Come on, Old Jack, don't make a fool of yourself any longer," after which he would walk on a loose rein while Cunningham smoked his pipe. In 1914 the Duke found Carbine lying in his stall with blood pouring from his nose. Diagnosed with a cerebral hemorrhage he was euthanized with chloroform, and "passed quietly away." Portland gave his skeleton to the Melbourne Museum; three of his hooves were made into an inkstand now at Government House in Wellington. His lasting legacy, however, can still be seen on racetracks throughout the world. CARBINE, bay colt, 1885 - Family # 2 - h.